With an ever-increasing population & pollution duo, life in urban cities might get lost in the cemented jungles. Terraced gardens are the new trend in cities that not only make your homes beautiful but also eco-friendly. Your terrace garden can be the perfect place to sip your evening coffee along with ‘chilli bhajji’ or a steaming cup of milk in the morning. If you are thinking about developing a terrace garden or renovating an existing one, then this article having Tips for growing & maintaining a terrace garden can prove useful. The planning for starting a terrace garden should ideally start when you are building your house. But in case of existing houses, there are a couple of things to look into. If these pre-requisites are there, then the terrace gardens can be started. In the absence of the necessary requirements, you can always make alterations to conform to the same. Beam and supporting pillars are essential for a strong foundation to hold the weight of your terrace garden. Proper drainage system is necessary. Unsupportive drainage systems can spoil your hard work, apart from ruining the building structure. The system needs to be regularly checked because even a small blockage can cause disturbance and harm the garden. Adequate sunlight is necessary for the garden to thrive, except in cases of exotic plants like palm that might not require too much sunlight. Lighting is an important aspect of the visual appeal of your garden. You can use Terracotta lamps and other fancy hanging lights on poles or frames. Ornamental shrubs are a great choice for a terrace garden due to the lack of enough space. Bonsai treatments can help in this; bonsai shrubs are available in nurseries. Mulberry, oranges and bougainvillea can be explored as possible options. Grass-decors can be a simple yet attractive way to spice up your garden. Make several steps of mud or fancy designs and plat them with grass, with lovely patterns of your choice. These grass patterns look great when seen from a height or a distance. Palm trees can add a perfect tropical touch to your garden. If your garden has adequate arrangement for shade, then short hybrid versions of palms called as “Garden Palm” are a good choice to go with. Bamboos are considered an exotic addition to your garden. They grow fast and can give a lovely, lush feel to your garden. Moreover, it’s one of the easiest in terms of maintenance. Bamboo shoots just need a vase filled with clean water and adequate sunlight. If you are a lover of rustic or sculptural looks, you can try patterns or designs of natural stones & pebbles of different sizes to make sculptures or structures or feature walls. You can also incorporate a pathway of smooth pebble across your garden. The serenity and musical sound of water is calming. You can have a glass aquarium or a small tank that can be used as a mini-pond for your terrace garden. Love the vibrant hues of flora? Then you cannot miss out on the colorful seasonal flowers. Right from roses to marigold and jasmine, they can add a splash of life to your garden. Do you have a preference for organic vegetables? Then you can give organic vegetables a try in a section of your garden. Apart from plucking off a couple of tomatoes or a bunch of mint/coriander on a Sunday morning, it can give you a chance to boast about your “organic tastes” in front of your guests who appreciate your terrace garden. If you prefer a rough and an organic look, then you can do away with artificial patterns. Rather go for a natural rustic look with fluid layout for your garden. Don’t forget to squeeze in a seat to sit back and enjoy. 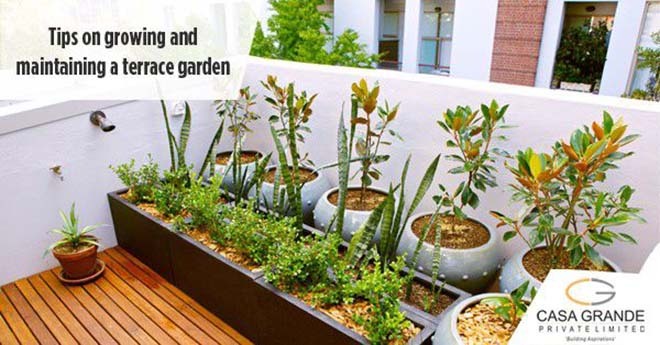 Maintenance of a terrace garden is not completely different from your courtyard or balcony gardens. After your vibrant garden is setup, you need to regularly check the drainage system. In case of a closed air space, proper ventilation and lighting is necessary for the plants to thrive. It’s good to plan a regular cleaning and pest-control schedule to keep your beloved terrace garden in good health. Your beautiful terrace will complete your beautiful home, for you to sit back and enjoy!